Aliens. Those darn Xenomorphs are always trying to shove something down the throats of humans. You know, maybe if they made the Chestburster embryos look like cookies, the Facehuggers could get cushy desk jobs. Or, you know, something else they have the skillset for. They’d probably make great massage therapists, what with all those little appendages. But we digress. The raison d’etre of this Warrior Alien Ceramic Cookie Jar is to bring you cookies. Preferably without raisin d’etres, because we always think they’re chocolate chips and then we’re all disappointed, but we don’t want to throw the cookie away because it’s a cookie and we took it and everything, but it’s not like we can put it back either now that our fingers have been all over it, so then we have to eat the dang raisins that should have been chocolate chips. Stupid fruit. Dang it. We digressed again. 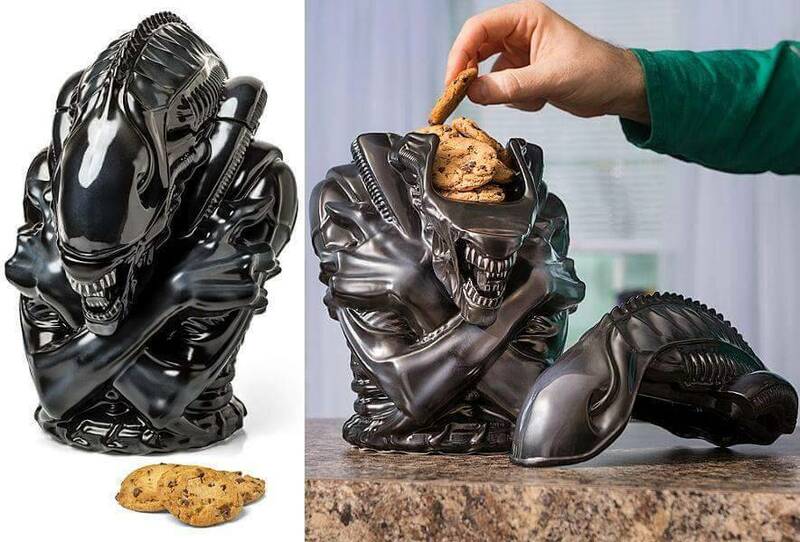 Big warrior Xenomorph wants to hold your cookies. Totally not going to kill you and use your body as a host. Much.